Online students crave interaction with classmates and instructors, according to a new report from Learning House and Aslanian Market Research. For the sixth annual "Online College Students 2017: Comprehensive Data on Demands and Preferences" report, researchers polled 1,500 students who are "seriously considering, currently enrolled in or have recently graduated from a fully online program" in an effort to better understand the behaviors and needs of the typical online college student. 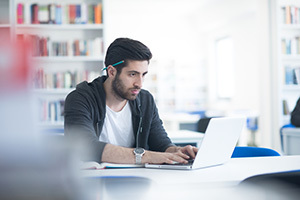 More than half of the survey respondents deemed interaction with their academic community important; a quarter asserted that "having more contact with their instructors and more engagement with classmates would improve the caliber of their online courses." Fifty-nine percent of the online students surveyed travel to campus one to five times per year in order to meet their instructor, attend a study group or otherwise participate in the academic community. 80 percent of respondents enrolled in an online program in order to advance or change their job, and 77 percent are taking advantage of the career services offered at their institution. Adapt online access to accommodate mobile technology. "Online learning is no longer new, and online students are becoming savvier consumers. It's no longer enough to offer flexibility and convenience," said Todd Zipper, president and CEO of Learning House, in a statement. "Institutions need to offer the right program, at the right price, in the right modality, and with the right support services in place to create a welcoming community that helps students achieve their career ambitions."